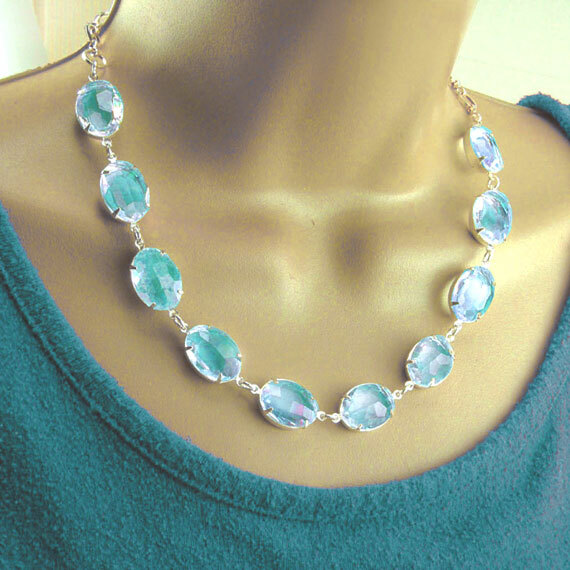 Emerald green glass gems – restock and BOGO sale! 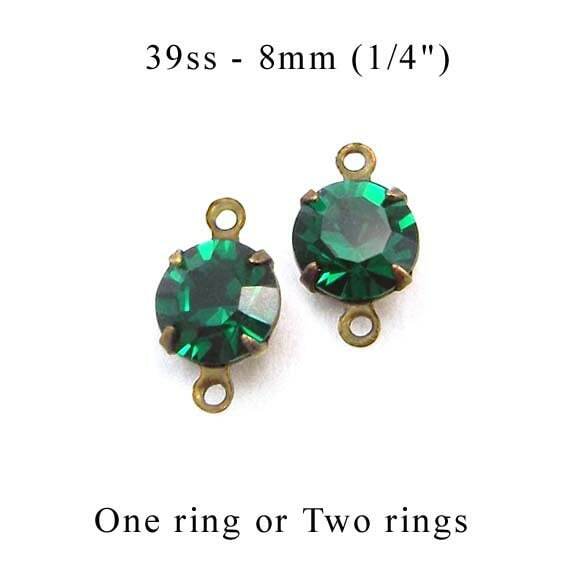 I’ve been waiting on these and woo hoo, just got in some new emerald green glass gems in a darling, tiny 8mm size – that’s approximately 1/4″ in diameter. These are adorable for earring drops, glass connectors, and even tiny pendants – and the faceting is just lovely! So to celebrate that the new packet has finally arrived, I’m having a BOGO sale! Buy one pair, you get the second pair free. You can select whichever settings you prefer – for each pair. Just let me know your preference when you order! The sale lasts from August 29, 2018 to midnight on September 3, 2018 – so anytime this Labor Day weekend you get a super sale price! No, this isn’t the “monsters on a chain” type Halloween jewelry. 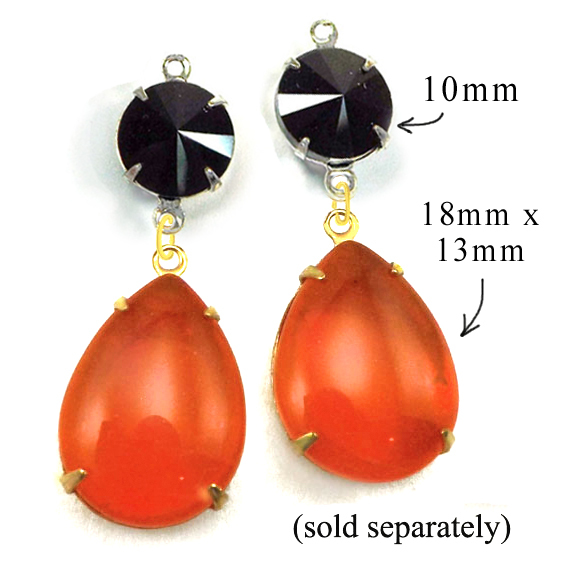 It’s actually pretty jewelry – that you can wear anywhere – only in black and orange, because it’s getting close to that time of year and hey, who doesn’t wear orange and black, just for fun, around Halloween time? DIY necklace design idea – use your pretty colors! 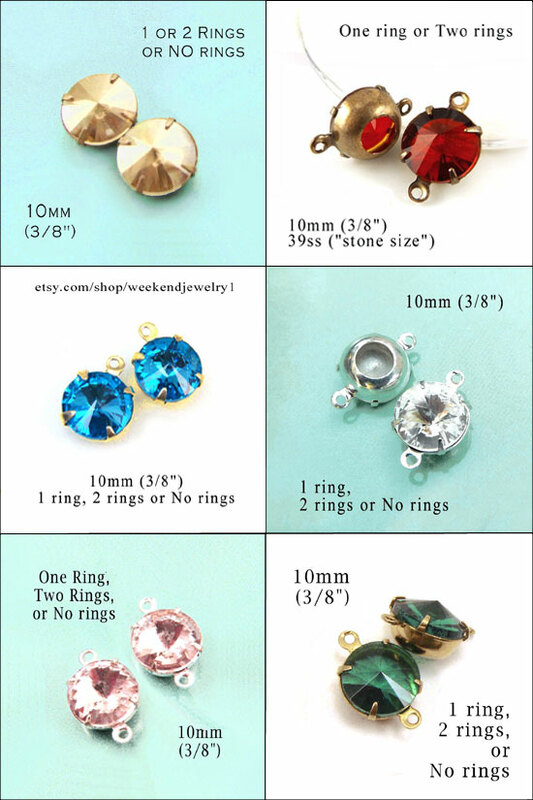 I just wanted to share another example of how a simple concept – oval glass jewels in two-ring (connector) settings – can make a fabulous piece of jewelry! I’m going to do a “fussy” design one of these days, because of course those can be wonderful. But clean-lined design with strong, faceted elements, can really work – you see what I mean! And as always, it’s the details that make the difference. 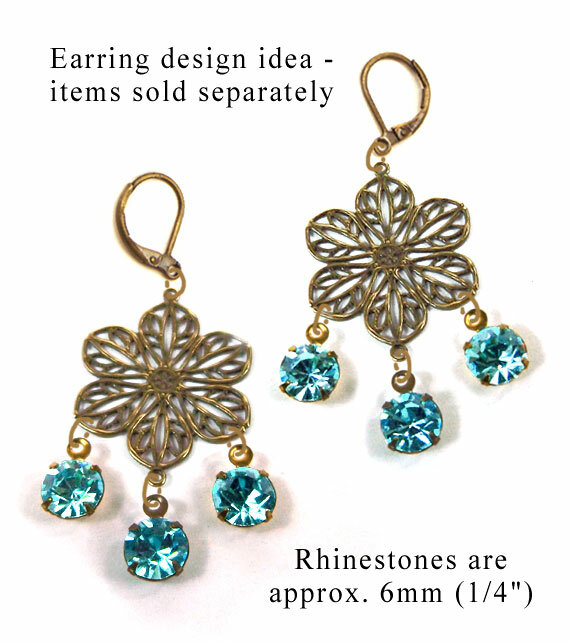 Tiny, pretty aqua rhinestones are set in patina brass or golden (raw) brass prong settings. The brass filigrees are a restock in my shop – my customers have been loving them and I totally agree – the flower filigree is so pretty! Link the filigree flower connectors and gems with sturdy little jump rings, add earwires, and your fantastic chandelier earrings are ready to wear. And of course you can customize them with your own details – colors, gem shapes, and extra details you’ll think of and I didn’t. Still – the basic idea totally works – and they’re doable and affordable and you will love wearing them! Or gifting them. And the earrings are gorgeous! 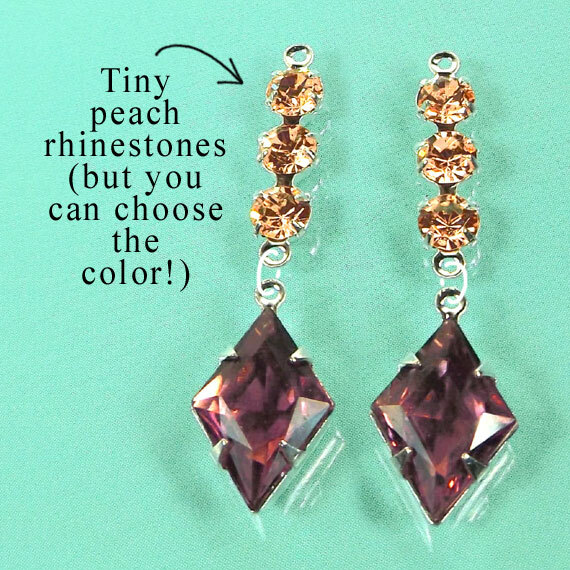 Just got in new peach rhinestones – only have one pic so far but there will be more coming. It’s a darling color! Okay, I have to admit – “fall 2018” colors means… Colors 🙂 I love how marketers talk about trending colors (predicting them I mean), and how this color or that color will be Hot next season. Well maybe. Personally, I think colors that look good *on you* are the colors that are going to trend for you. Marketers won’t make money off that prediction. But the colors that are in fashion this season, or next season, or any season – are the ones you like! Great glass beads – a BOGO sale – sparkling color – you’ll love it!